UV window film is an excellent product to help you continue your branding on windows, glass entryways and so much more. By using these often underutilized areas for promotions, company branding and other marketing and advertising campaigns, you can expand on your branding and draw attention to the products and services you most want your customers to notice. 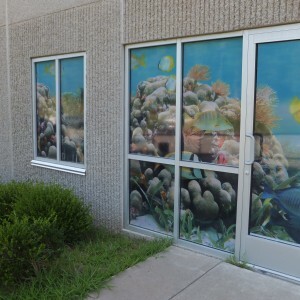 At Ultraflex Systems, Inc, we offer window film products that can help you bring your advertising to new levels. UltraVision® Window Perf 06/40 UV is a perforated, white gloss, calendared, graphic UV window film with an adhesive backside and paper backer. Additionally, it features a center release liner that catches extra ink and keeps it from clogging the perforated holes. The result is vivid graphics with a 40% open area for two-way viewing. UltraVision® Window Perf 60/40 UV is designed for exterior applications including in-store windows, building windows, vehicle windows and more. Printable with solvent, eco-solvent and UV inks, UltraVision® Window Perf 60/40 UV is available in rolls with widths of 39” or 54”. Ultraflex Systems, Inc. is known throughout the industry for bringing new products to market every year. We have been serving the printable media needs of advertising professionals for over 25 years, and we are committed to offering our clients the highest quality products and unparalleled service and support. We also offer technical data sheets on each of our products and can provide recommendations on the products that will best meet your needs. We are proud to serve countless businesses, including printers, advertising agencies, marketing firms, and corporations, in the USA, England, Scotland, Mexico, Canada and elsewhere worldwide. Contact us today for more information or quotes on our UV window film products or any of our other cutting-edge printable media.